"We are having an exhibition of the Bedjump series with the opening on Saturday, 10 April. The exhibition will be at Exposure Gallery at the Biscuit Mill. We will have a bed there on Saturday for everyone to jump on and have their photographs taken." Jumping on a bed while having your photo taken may sound like a strange concept... but if you're keen to either buy one of the photos, or have your photo taken (presumably for free), stop by the Biscuit Mill (map) on Saturday morning. Posted in Activities and tagged food, market on Monday, 29 March, 2010 by Paul. I’m very keen on Neighbour Goods Market, especially the food hall. Last time I was there I’ve spent all the morning taking pictures of anything eatable. Fantastic, it’s the only market of CT that reminds me the open air markets we have in Italy in all the town. In Milano or in Genoa avery district has his weekly market, where you can find any food you desire, clothing and any thing you need. There are other food markets in CT for fruit and vegetables? Yes, the pictures of people jumping on the bed will be taken for free and emailed to you. Hi Paul! Thanks so much for this write-up! My name is Kelly. I’m the conceptualist/producer of the PLAYJUMPEAT project, & just wanted to say that the Gallery Show is jointly “hosted” by both EXPOSURE Gallery & Messy Monkey Arts. Four photographers were involved in this year-long project, including: Inge Prins, Charley Pollard, Antonia Steyn, & Saul Wainwright. Kelly & the PlayJumpEat team! Saul, Kelly, thanks for the info. It sounds awesome, but I unfortunately don’t think we’ll be able to make it. Good luck with the weather! 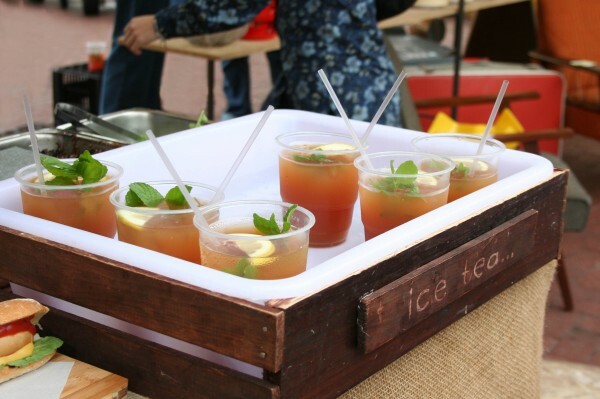 I am prepared to consider selling my soul for the recipe of the iced rooibos tea at the neighbourgoods market!